A Year of Being Here: Dana Yost: "The Three Bridges Trail"
in my last days, and one will be the Three Bridges Trail. the narrow path, across the three stone bridges. But I will see, hear, smell for myself. almost as soon as we set foot on the dust and gravel. It is like stepping beyond the curtain, into the Emerald City. in a branch over my head. by the thickness of leaves: it is almost German forest, medieval. swords and axes clanging and cleaving, unmerciless battle? But, then, my imagination runs beyond reach of the reins. Walk with me, in the green and the cool. soft. Blanket of a crib. in deep staredown with us, as real as the aroma of juniper. Did we matter? Did we lift the lives of others? did we dream — or was it all mad? Look at the butterflies, the gem-green beetle. is one of the good. "The Three Bridges Trail" by Dana Yost. First published in Jellyfish Whispers, July 2012. 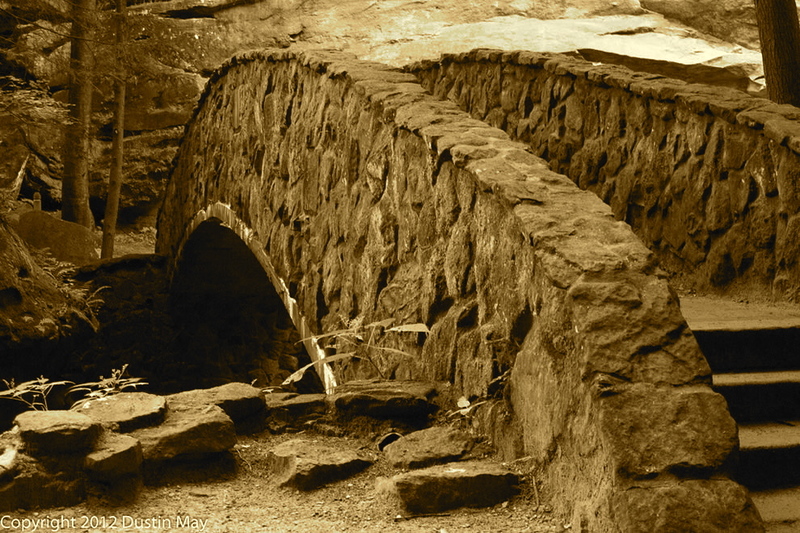 Photograph: "Arched Stone Foot Bridge at Old Man’s Cave," by Dustin May, 2012 (originally color).